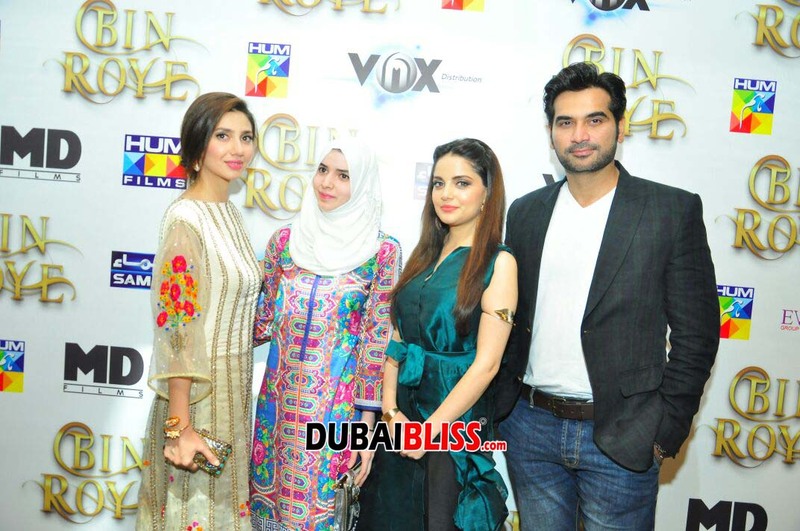 The Bin Roye star cast, Mahira Khan, Armeena Khan, Humayun Saeed along with Momina Doraid and the bigwigs behind the film gathered at Vox Cinemas, Burjuman Dubai last night for the music launch of the film which is scheduled to be released on Eid Ul Fitr. The leading actress Mahira Khan stated that she has worked very hard for this film and have high expectation from the audience. The music of Bin Roye includes the likes of Rahat Fateh Ali Khan, Abida Parveen, Shiraz Uppal, Ankit Tiwari, Rekha Bardwaj and others. Bin Roye (title track); Lyrics by Shakeel Sohail. Composed and sung by Shiraz Uppal. Ballay Ballay; Lyrics by Shakeel Sohail. Composed and sung by Shiraz Uppal and Harshdeep Kaur. Teray Bina Jeena; Lyrics by Sabir Zafar. Composed by Sahir Ali Bagga. Sung by Rahat Fateh Ali Khan and Saleema Jawwad. Chan Chariya; Lyrics by Sabir Zafar. Composed by Shani Arshad. Sung by Rekha Bhardwaj and Momin Durrani. Maula Maula; Lyrics by Sabir Zafar. Composed by Shani Arshad. Sung by Abida Parveen and Zeb Bangash. O Yara; Lyrics by Sabir Zafar. Composed by Waqar Ali. Sung by Ankit Tiwari. Next articleBring Smile on the face this Ramadan!